Triple K 1911 Single Stack. Designed Specifically for Officer size 1911 Pistols. 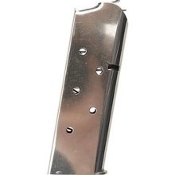 These mags position rounds as high as possible for reliable feeding in all officers 1911 pistols.